Up until around this time last year, you wouldn’t have ever seen me eating pickles. Not ever. I picked around them my entire life. I sat in awe watching my college roommate eating them directly from the jar. Actually, shaking my head in bewilderment better describes it. And then, as if a switch flipped, I fell head over heels for them. I guess it started with the homemade refrigerator pickles I made last summer. I made them for Kyle, tried one here and there (how could I not try what I grew and made with my own hands??) and soon found myself adding them to sandwiches and burgers, and munching on them…from the jar! There was also this pickle dip earlier this summer which sort of sealed the deal towards my pickle love. I kind of threw my pickle recipe together from a few different recipes last summer so I couldn’t recreate it if I tried but these garlic dill pickles are just as stellar. Crisp and fresh cucumbers are key to great pickles so make sure you use them as soon as you bring them home from the store or farmers market, or within a day or two of a CSA delivery or picking them from your garden. You can eat these pickles within a few days of making them but they’ll be better the longer they sit in their briny juice. And since I’ve got a few more cucumbers happening in my garden (like 20? 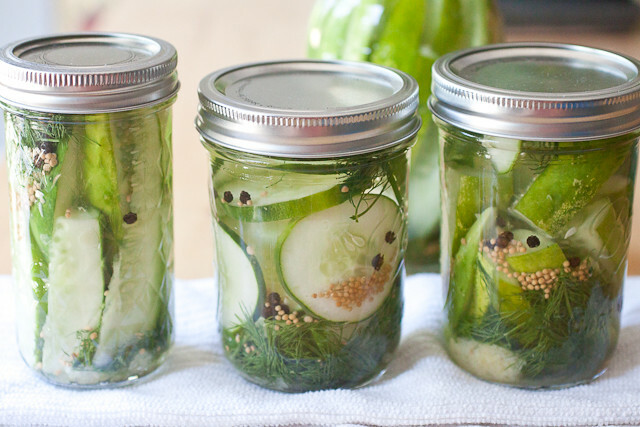 ), I’d say there are more of these pickles in our future. Add a couple sprigs of dill and a finely minced or pressed clove of garlic to the bottom of each of the jars. 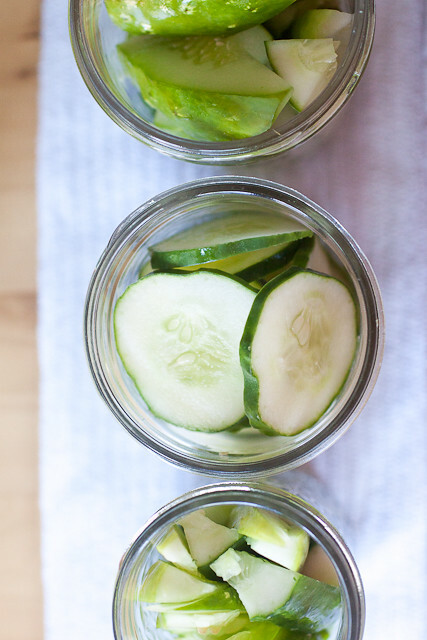 Pack each jar full of cucumbers - make sure the cucumbers don't crest the top ½-inch of the jar as you'll want to make sure all of the cucumbers are covered with liquid. In a 4-cup liquid measuring cup or a pitcher, mix the water and vinegar together. Stir in the salt until it is dissolved and then the mustard seed and peppercorns. Pour the liquid (including the mustard seed and peppercorns) into each jar, taking care that the liquid seeps in between all of the cucumbers spears/chips/slices and covers all of the cucumbers. If you need more liquid, make a little more and finish up the jars. If you wish, add a few more sprigs of dill to the top of the jars. Seal up the jars and refrigerate for at least 2 days before eating. Add a couple sprigs of dill and a finely minced or pressed clove of garlic to the bottom of each of the jars. Pack each jar full of cucumbers – make sure the cucumbers don’t crest the top ½-inch of the jar as you’ll want to make sure all of the cucumbers are covered with liquid. I think your Dad and I were second only to you to taste these pickles. They are outstanding and as I told you, they taste like the very expensive pickles that are available in the supermarkets and which I tend not to buy because of their price. And according to your recipe, they are so-o easy to make that maybe even I will try. Thank you so much, my dear. I would probably go through the whole jar of these in one sitting. I love pickles!